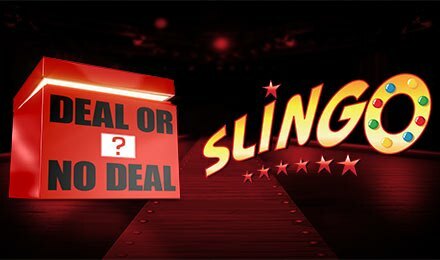 Try combining the TV show, Deal or No Deal with the Slingo brand and see what happens! You are presented with Slingo Deal or No Deal at Wicked Jackpots. This game is a combination of bingo and slots, crafted by Gaming Realms. It is set against a dark red backdrop on which a 5x5 grid containing numbered boxes is displayed. Match a number to open the corresponding box which reveals and eliminates one of the prizes shown on the paddle. Furthermore, enjoy original features such as the Banker’s Offer. Take pleasure in loading this game on any device at Wicked Jackpots! Fire up your gameplay on Slingo Deal or No Deal by selecting any bet amount on the Stake display. You can then press the green “Start Game” tab to activate the single slot reel. Choose a lucky box, while the others fill up the grid. Ten spins are initially at your disposal. Match the numbers on the grid with those on the reel, just like in the gameshow. If a number matches, the box will open and eliminate the corresponding prize amount from the game. Your aim is to form a Slingo with 5 opened boxes next to each other horizontally, vertically or diagonally. If you wish to boost up the value of the other prizes, simply create more than 5 Slingos. Bet Levels: Levels are not included on Slingo Deal or No Deal. Coin Values: The stake values vary from 1p to £100. Look for Jokers and Super Jokers on Slingo Deal or No Deal! That’s because both act as Wilds. Jokers are able to open any box in the column. As for Super Jokers, they open any box on the entire grid. Did you notice the Devil on the reel? This symbol blocks any potential matches on the grid. Are all your 10 spins over on Slingo Deal or No Deal? No worries since you can always purchase extra spins! This allows you to continue your gameplay and win. When the Free Spin symbol shows up on Slingo Deal or No Deal, you are rewarded with an additional spin at the end of each round. Deal: Take the Banker’s Offer while the game comes to an end. No Deal: Open your lucky box and collect the value found inside. Spin: Continue with the game. If you wish to play on, you can obtain another offer from the banker after each spin and every time, the same three options are available. Make the most of Slingo Deal or No Deal at Wicked Jackpots and relish a fun-filled gameplay. Wish you lots of luck!